Some diet plans specify drinking parsley tea with a least one meal a day, leaving the would-be dieter to wonder how exactly parsley helps you drop the pounds. Unfortunately, parsley tea isn't a magic brew for dieters. Its mild diuretic properties can, however, help to jump-start your diet and boost your confidence as you lose water weight. Exercise and balanced meals are the surest path to sensible weight loss. Always check with your doctor to plan the best weight-loss approach. Parsley tea temporarily facilitates weight loss by helping the body rid itself of excess water. Water retention can be related to premenstrual syndrome, to excess sodium in your diet, to pregnancy or to certain medications. Diuretic vegetables and teas help to flush the system of some of this excess fluid, according to the University of Maryland Medical Center. Although parsley tea is considered a mild diuretic, ask your health-care practitioner before trying it on your own. Do not drink it if you are taking prescription diuretics. For people cutting calories, vegetable broths and teas provide additional nutrients that they may be forgoing as they avoid certain foods. Parsley contains high amounts of potassium and vitamin A, as well as folate, calcium, vitamin C and phosphorus. It also contains a flavonoid known as quercetin. According to the University of Maryland Medical Center, quercetin's anti-oxidant properties may help to lower cholesterol and high blood pressure while protecting you from heart disease and certain cancers. It may also help to relieve symptoms of allergies. If your health food store stocks parsley tea, use one teabag per cup of water up to three times a day. Otherwise, the dried parsley found in the grocer's aisle works just as well. Pour 1 cup boiling water over 2 teaspoons of dried parsley, steep for 10 minutes and strain. 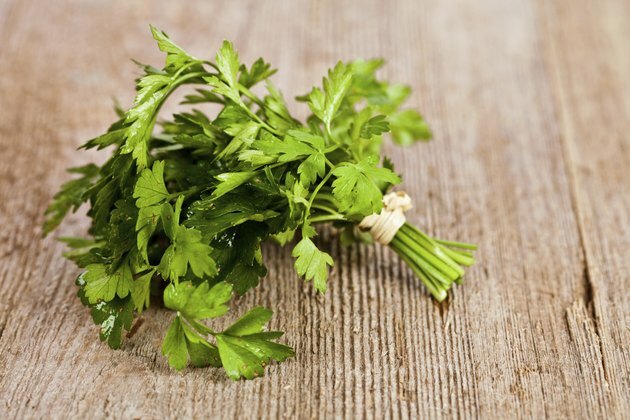 Herbalist Jeanne Rose suggests blending parsley with smaller portions of some other herbs known for their diuretic and cleansing properties. To use fresh herbs, pour 1 quart boiling water over 1 large bunch parsley, 1 chopped blackberry leaf, 1 chopped dandelion leaf, 10 cherry stems and 1/2 teaspoon of celery tops, couch grass, corn silk and fennel seed. Strain and drink the tea throughout the day. To use dried herbs, use three parts parsley to one part each of the herbs named in the fresh herbs recipe. Rose recommends drinking several cups of the tea for at least one day. Whatever merits other herbal weight loss remedies may -- or may not -- possess, parsley tea shouldn't be confused with supplements like hoodia. Manufacturers claim that the botanical hoodia suppresses appetite, which results in weight loss. Parsley tea, on the other hand, helps you lose inches only if that extra bulk comes from retained water. Additionally, even herbal diuretic teas can be dangerous if you also take prescription diuretics. Talk to a doctor before using herbal teas for any medical condition. If you dislike the taste of parsley tea or prefer other natural remedies to treat water retention, UMMC recommends drinking dandelion leaf tea or eating more pineapple, grapes, leafy vegetables and asparagus. Is Cassia Acutifolia Tea Good for Losing Weight? Can Hibiscus Tea Be Made From Any Hibiscus Plants?